Full disclosure, I received a copy of this book from the author however I have voluntarily chosen to write a review. All opinions are my own. 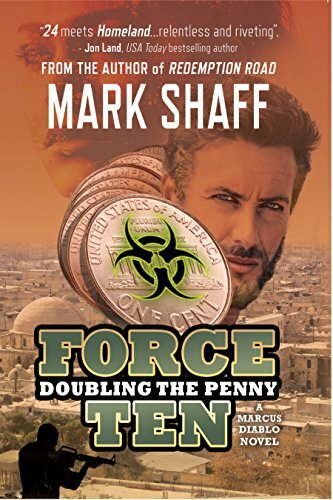 Doubling the Penny is the second in the series of Force Ten novels by author Mark Shaff that follows the life of Marcus Diablo as he seeks to avenge his wife’s death and take down the man responsible for her very public execution. Set approximately six months after the close of Redemption Road, Marcus, his family and the rest of Force Ten have set up residence at “Beginnings”, the vast, secluded Canadian Ranch that doubles as headquarters for the mercenary group Force Ten. After a Black Friday internet “crash” takes out most of the United States’ internet access, Marcus and Force Ten wonder if this isn’t the latest in a recent series of attacks on the States by Islamic radicals. Force Ten mobilizes to attempt to locate the source of the supposed EMP that has crippled a recovering nation, but when thousands of people simultaneously fall ill, and the contagions begin to spread like wildfire across the nation, Marcus realizes that the internet was only a ruse to keep watchful eyes and resources away from the main attack. For the second time in less than a year, Marcus finds himself knee deep in matters of National Security as he and the team take on the task of locating the origin of the latest attack and the person responsible. As more details come to the fore, Marcus finds himself forming an alliance with an unlikely partner to bring down the instigator. For me, I really think that I liked Doubling the Penny more than Redemption Road. Don’t get me wrong, they are both brilliant, but for as much as Redemption Road did to set the scene and bring Marcus to the place where he was consumed with vengeance and a burning desire to enact it, Doubling the Penny did to bring the story full circle and provide Marcus and his entire family not only with the closure they sought, but also a glimmer of hope. Just like its predecessor, Doubling the Penny has action and adventure spun into a web of revenge and intrigue. The latest plot and the delivery system is pure evil genius. If you think about it, the situations depicted as were the ones in Redemption Road are very feasible. That aspect alone is terrifying, and I really hope that Shaff does not give any would be bad guys out there any ideas! At times, the story was heartbreaking as the team find themselves in the absolute pit of humanity while they search for answers. Marcus wasn’t the only focus of the story in this one as there was also a bit of back story for a few of the Force Ten members as well as the perpetrators. I can definitely see this being the end of this story arc for Marcus, but not the end of his association with Force Ten. There will always be evil to combat, and Marcus and his elite team will always rise to the challenge. If there will be other books in this series, it is hard to tell but if there are I will be interested to see what mastermind Marcus and Force Ten encounters next.